GoodBoy EA is a new concept developed after many years of Forex trading experiences. It uses multilevel complex algorithms and multitimeframes analysis to detect trends. It trades in the direction of a strong market impulse. The EA is optimized with it's default settings to pass backtesting from 2011 to 5-Aug-2018 (Release date). Please visit GoodBoy's Blog for set files and other notes. Price averaging of same kind trades (Buys separated from Sells). Hidden take profit and stop loss. EA settings: 3 important settings should be made: Use default + SET GMT offset properly, Turn Time Filter to ON, Set Starting Blance. Brokers: Low commission brokers are recommended. MT4 Spread setting for backtest: 10 (EA works properly from 0 to 25). Backtest Period: 2011 to 2018 (EA is optimized over this period). Trade Comment: Your comment here. Enable Smart Merlin Filter: True (Recommended). Enable Artificial Instinct: True (Recommended). FIFO Compliance: False (Enable this parameter for FIFO brokers only). Trade Direction: BothDirections (Forces the EA to trade in one direction only). 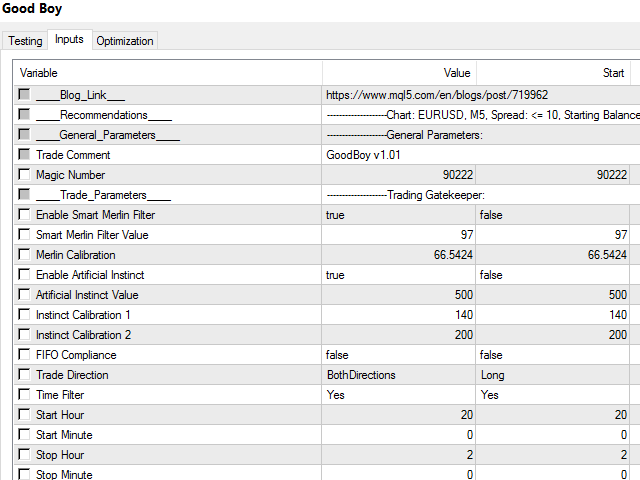 Time Filter: Yes (Allows the EA to trade according to the timer below, it is necessary to set this to YES, by default the EA has this set to No because of mql5 restriction and validation rules, you must turn the Time Filter to "Yes" or your tests will fail !!!). GMT Offset: +3 (GMT offset between your broker's time and GMT time, very important to set it properly, please read the blog). Start Hour: 23 (0 to 24). Start Minute: 0 (0 to 60). Stop Hour: 5 (0 to 24). Stop Minute: 0 (0 to 60). Lot Sizing Method: MoneyManagement (This determines the size of the starting lot to be either a fixed lot size or a risk % based on the balance of the account). Fixed Lot Size: 0.01 (If FixedLot is selected, here you specify the starting trade lot size). Starting Balance: 3000 (This parameter should be equal to your Starting Balance). MoneyManagement Risk Percent: 0.25 (if MoneyManagement is selected here you specify the percentage of the balance to use for the starting trade lot size). Hidden TP in PIPS: 10 (This sets the minimum Take Profit of a single trades in pips, note that the Buy trades are separated from the Sell trades and this parameter is hidden from the broker). Hidden TP in Money: 20 (This sets the minimum Take Profit basket of the same kind trades in money, note that the Buy trades are separated from the Sell trades and this parameter is hidden from the broker). 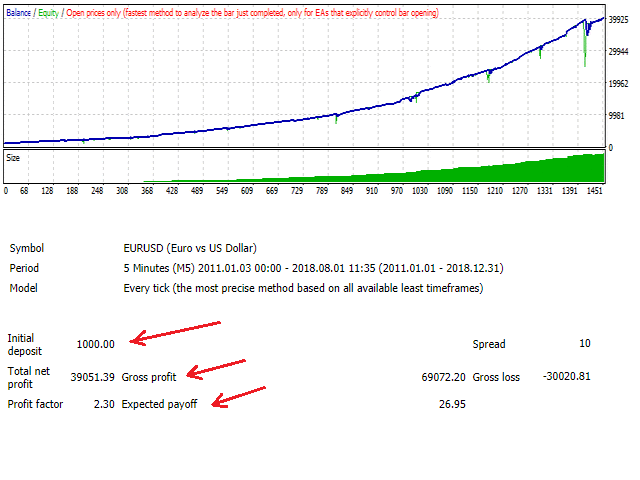 Hidden Basket SL in PIPS: 1000 (This sets the maximum Stop Loss basket of the same kind trades in pips, note that the Buy trades are separated from the Sell trades and this parameter is hidden from the broker). Lot Step Short: 0.00 (This is the additional lot size for the next grid Sell trade). Max Short Trades: 15 (Maximum number allowed of all open Sell trades). Min Trade Distance Short: 10 (Minimum positive pips required in price change to open a next grid Sell trade). Lot Step Long: 0.00 (This is the additional lot size for the next grid Buy trade). Max Long Trades: 15 (Maximum number allowed of all open Buy trades). Min Trade Distance Long: 12 (Minimum negative pips required in price change to open a next grid Buy trade). Send Push Notifications on DrawDown? No (If enabled sends you push notifications on your MetaTrader 4 phone app, this option requires you to have a MetaQuotes ID which you can get for free from your account settings on mql5.com). DrawDown Threshold %: 50 (The threshold to trigger a push notification, once the account has a drawdown of -50%, a push notification is sent to you). i rented the Goodboy to try for 1 month. is it possible to run with 500 usd ? how ?